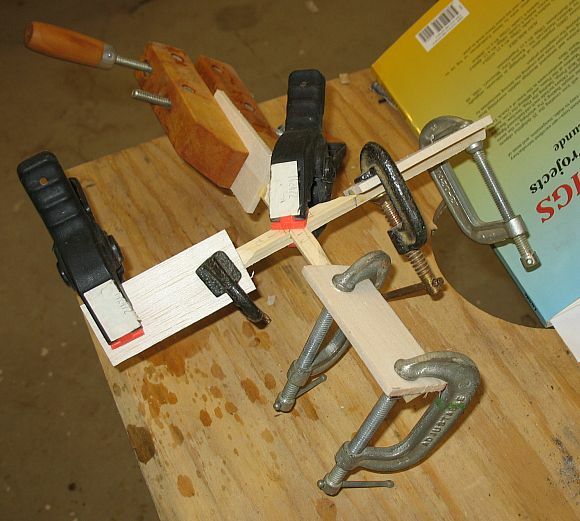 It takes a lot of clamps to glue up the propeller! I used 3/16" balsa wood for the blades. The 3/8 x 3/8 lapped main blades are very fragile compared to 3/4 x 3/4" main blades. 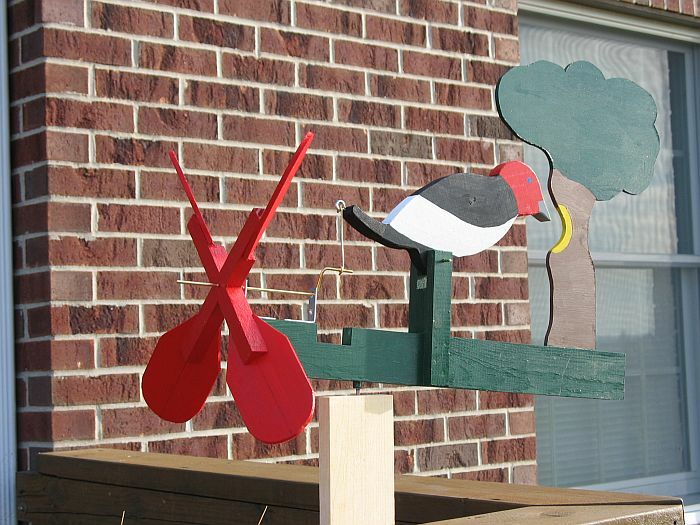 Here is a short video showing the woodpecker whirligig in action. This whirligig turned out a lot larger than I expected. Per the book, I bought some 3/8" diameter 2" long tension pins from McMaster-Carr. It turned out a 16d or 16 penny nail had too much clearance...whirligig would not set level per photo above. I did some research on nail size, and a 20d nail fits much better. The book also said your local hardware store would have a 6-32 die to thread the main brass drive shaft so nuts could be threaded on. Our local Ace hardware only carried 3/8" and up dies. I bought a 6-32 from McMaster-Carr. 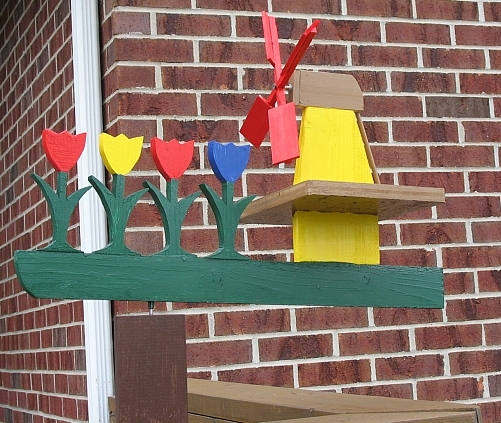 My sister Karen brought over her favorite garden decoration, a windmill that sets on top of a high tower. Several of the blades had come out. We simply cleaned out the glue and wood remnants in the slots in the center 4" diameter piece, then reglued the blades back in with Titebond yellow exterior glue. The main shaft is screwed into the roughly 1x1 inch piece using a screw type fitting with 1/4" pilot hole, like is used on particle board furniture. I drilled a new 1/2" hole and glued in a piece of 1/2" dowel. I cut it to length after the glue dried, then drilled a new 1/2" pilot hole for the fastener. It split the 1x1 piece slightly when I screwed it in. If it doesn't hold up, I will have to make a new piece. I started to draw this in Google Sketchup, but had trouble drawing the angular base. The outside of the base is 8x8. I will have to refer to my Sketchup drawing for the other key dimensions. Now I hope it holds up for a few more years before I have to make a new one! OOOps...after only a couple of weeks in the wind, somehow the windmill blew up...and broke the blades again. Maybe top portion fell off the stand. Further investigation is required. Well, after being repaired in 2011, it held up for 6 years outdoors before it broke again! I took it back to my shop for repairs. I made a whole new propellor assembly from pressure treated wood, and a new base from pressure-treated. Hopefully, it will hold up longer than 6 more years!! 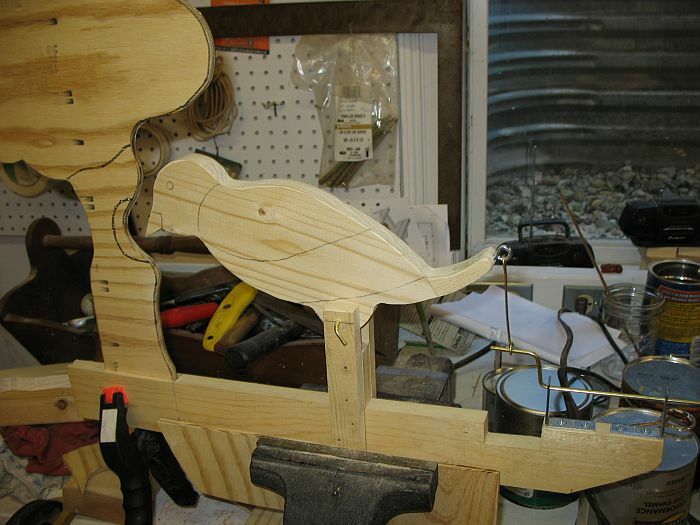 I improved the design of the woodpecker by replacing the steel shaft brackets with brass brackets. The pre-drilled screw holes in the steel bracket had too much slop for the shaft which created a lot of noise when it ran. I also replaced the wire to the woodpecker with a piece of brass plate to reduce slop and noise. The mounting nail was replaced with a bent steel bracket to give better support to the whirligig. Next I cut out all the pieces and then painted them. I used 5 colors. I decided to try a new mounting method to mount the whirligig on a 5/16" threaded rod. I cut out 2 pieces of brass plate 3/4" by 2" by 1/16" thick. I secured the brass plates to the whirligig using 4 sheet metal screws. This whirligig runs very smoothly with no clanking metal noise like the woodpecker whirligig has. Probably because the crankshaft is retained in wood versus 2 L-shaped brass brackets. Next step is to try it out in the wind! I ended up making a whole new propellor assembly. The new propellor lasted the entire rest of the Summer of 2011. 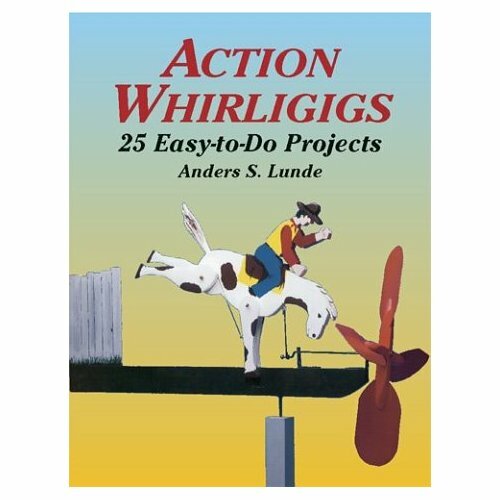 This whirligig incorporates some of the things I have learned from past projects. I used wood bearing versus steel angle brackets to reduce noise. I used 2 brass plates to mount it on a 5/16" dia bolt. The propeller is also heavier duty with the blades made from 1/4" pine. We live on the northwest corner of town, and therefore we get very strong winds. By the end of the Summer of 2011, all 4 of my whirligigs were broken from the wind. Over Christmas of 2011, I repaired and upgraded all the whirligigs. The main drive-shaft broke. I increased the size from 1/8" to 3/16" diameter brass. I had earlier bought a die from McMaster-Carr to make threads on the new 3/16" diameter rod. I then made another design upgrade to better withstand the high winds. I replaced the eye bolt screwed into the wife with a 3/16" brass rod through her body as shown in the picture below. On other whirligigs, the eye bolt got pulled out of the wooden body over time. I peened the left hand side of the through bolt and used a threaded nut on the right hand side. I had to also bend the brass plate so the drive shaft could rotate freely. Hopefully, this whirligig is ready for another season. 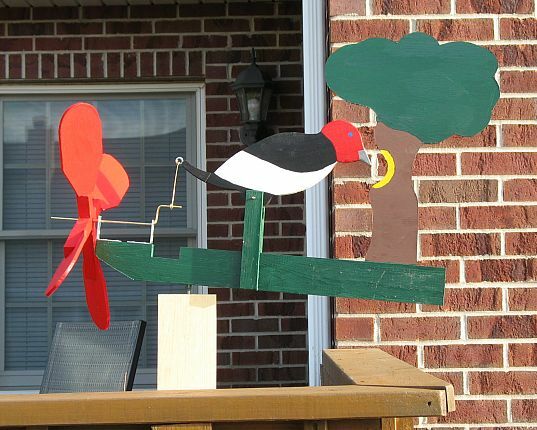 This whirligig lasted the longest because it has no moving parts except the propellor. I made the original propellor grades from interior grade Luan, so they gradually deteriorated in the weather. 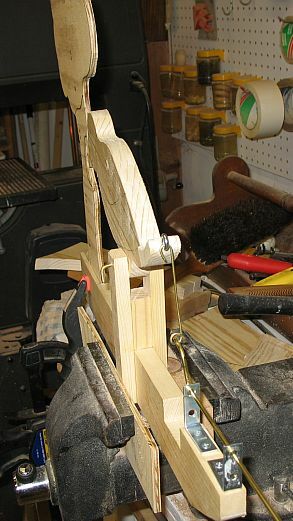 I made up a new jig for the drill press for making the propellor hubs. I made a 45 degree grooved piece which is clamped to the drill press. You can then feed the hub into the Wagner Saf-T-Planer and mill the surface the blades mount to. A U.S. retiree living in Costa Rica contacted me via email. He wants to learn how to build the Who's the Boss Whirligig. He has a computer in Costa Rica, but no printer to print off patterns. He is visiting the States soon and has a U.S. mailing address. I decided to make him some cardboard patterns, and one unpainted model for him to paint and assemble. 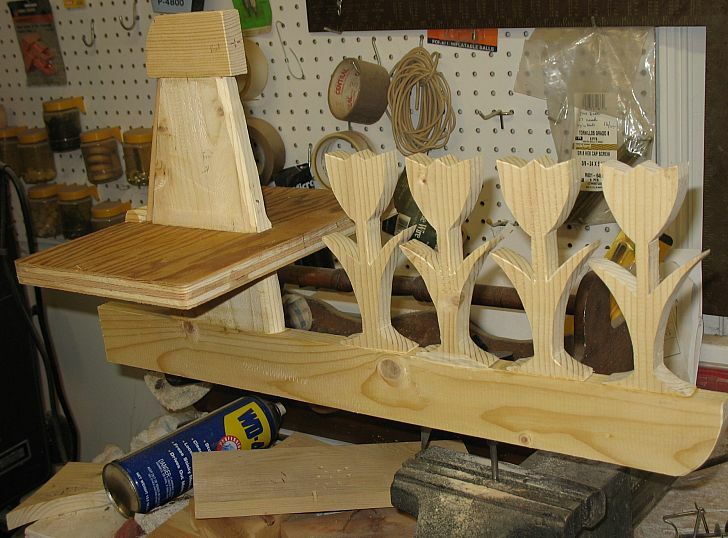 I then used these patterns to make the parts for one whirligig. I then cut these out using the scroll saw. It is nothing fancy, just a 45" groove cut in a piece of scrap board, which holds the hub at 45" to plane it. This is not exactly the same design as in the book, because I beefed it up so it would last longer in high winds. This includes 3/16" versus 1/8" diameter brass shafts, using a thru-bolt through the woman's body versus an eye screw, and 2 brass plates to mount the whirligig on a 3/8" diameter bolt.  Hopefully, this unit will find a happy home in Costa Rica! I packaged up the parts into 2 different packages, and mailed them from the Congerville, Illinois post office to the U.S. address. A woman in England asked me to build her the MAN CRANKING THE OLD CAR whirligig. She is going to paint it, so my model will be unpainted. I did not have cardboard patterns already made for this whirligig, so I made cardboard patterns first. I printed out each piece from Google Sketchup, then glued each piece to cardboard, and then cut out the patterns. I traced all the places where the whirligig needs to be painted, as shown on the tires and wheels above. 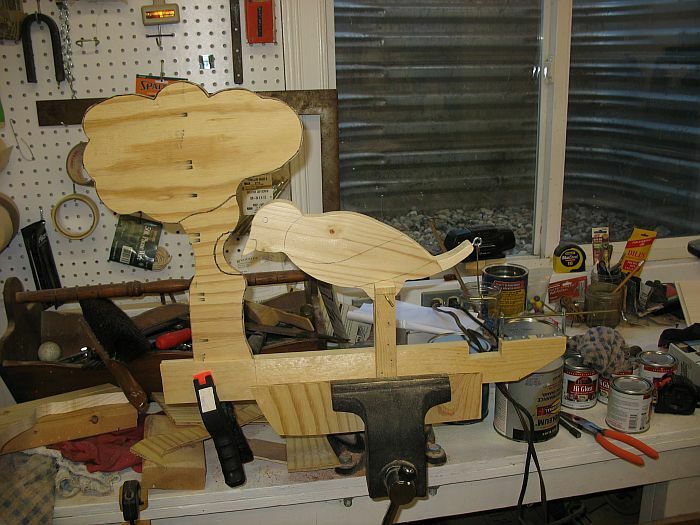 I planed down some pine to 1/4" thick for the propeller blades and the man's thighs. I also planed some pine down to 1/2" thick for the man's arms. This model worked very smoothly operating the propellers by hand. It is too windy where they live to really put it outside every day, so it stays indoors as a decorative piece.